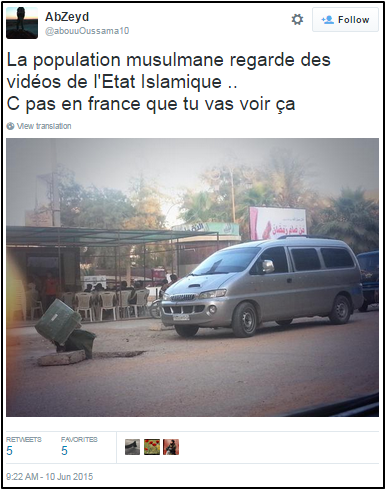 “Abu Osama” is a French-speaking propagandist and recruiter for ISIS. Osama uses social media outlets—including Twitter—to propagandize and recruit members to ISIS. 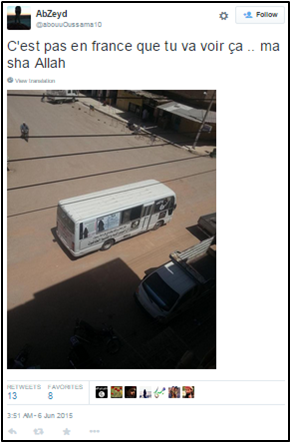 Abu Osama appears to have maintained at least two accounts—@AbouOuss1020 and @abouuOussama10—that retweet each other. 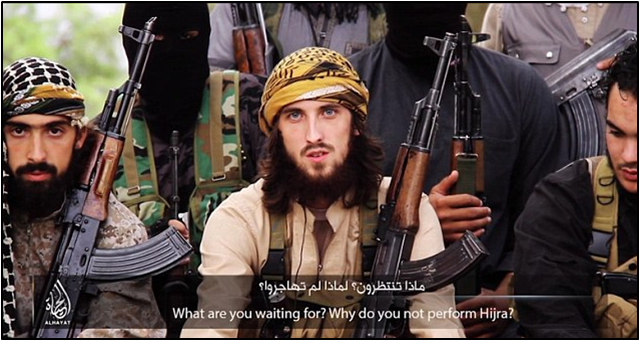 Though unconfirmed, it appears Osama is also the same French recruiter as Abu Osama al-Faranci, who has appeared in an ISIS video titled “What Are You Waiting For?”Des combattants français de l’Etat islamique appellent les musulmans à commettre des attentats en France,” MEMRI FR, November 20, 2014, http://www.memri.fr/2014/11/20/des-combattants-francais-de-letat-islamique-appellent-les-musulmans-a-commettre-des-attentats-en-france. The video, produced by ISIS’s Al-Hayat Media Center, features al-Faranci pressuring his audience to make hijrah (migration) to ISIS territory. Through Twitter, Abu Osama uses guilt, fear, derision, intimidation, and other pressure tactics in order to convince French Muslims to join ISIS. On August 8, 2015, Osama tweeted, “Are they good your vacations in the sun? You had fun, huh? And your brothers who are being killed bc you stayed home, does that cross your mind occasionally?”Abu Osama, Twitter post, August 8, 2015, 8:09 a.m. On August 2, 2015, Osama tweeted, “Prepare an answer to the question, ‘Why didn’t you fight My enemies like I commanded you’….”AbZeyd, Twitter post, August 2, 2015, 1:58 p.m. These types of posts come in contrast with more direct tactics for recruitment, including a June 2015 post wherein Osama tweeted, “Hurry, there are still routes open for the Hijra [migration]… #Tawakul [trust in Allah]”AbZeyd, Twitter post, June 17, 2015, 12:44 p.m. In another June post, he wrote, “We’re almost at the middle of the night, leave your tel[ephone] and your pc [computer] and pray to your lord for your brothers. Baraka Allah fik akhi [May Allah bless you, brother].”AbZeyd, Twitter post, June 14, 2015, 4:23 p.m.
Osama’s posts also idealize violence, and praise ISIS’s use of violence in particular. On August 3, 2015, Osama posted, “The pride you will feel when you have a Kalash[nikov rifle] in hand, when you will ensure that Allah’s laws are enforced on Earth….”Abu Osama, Twitter post, August 3, 2015, 2:42 a.m.
Abu Osama has also praised and rationalized ISIS’s history of violence. In June 2015, he touted ISIS’s killing of “46,000 disbelievers.”AbZeyd, Twitter post, June 11, 2015, 8:46 a.m. In August, he posted a tweet in alliance with ISIS’s rationalization of violence, writing, “Oh you Muslims, Islam has never been a religion of peace, Islam is a religion of combat.”AbZeyd, Twitter post, August 1, 2015, 7:13 p.m.
Osama has also used Twitter to idealize life under ISIS rule, writing on August 3, 2015, that “the best sensation that I’ve had is when I took my first steps on the land of Islam [ISIS-held territory]…”AbZeyd, Twitter post, August 3, 2015, 12:28 p.m. In that vein, Osama occasionally posts photos advertising life under ISIS rule, looking to emphasize the so-called Islamic nature of ISIS territory through his photos. @AbouOuss1020Abu Osama, Twitter, accessed August 17, 2015, https://twitter.com/AbouOuss1020. ‏@abouuOussama10AbZeyd, Twitter, accessed August 17, 2015, https://twitter.com/abouuOussama10. Abou-Osama al-Faranci“MOYEN-ORIENT . Djihadistes français : la propagande 2.0,” Le Progrès (Lyon), November 21, 2014, http://www.leprogres.fr/france-monde/2014/11/21/djihadistes-francais-la-propagande-2-0. Abou Oussama al-FaransiBoris Thiolay, “L’organisation Etat islamique et ses recrues pour l’apocalypse,” L’Express (Paris), January 22, 2015, http://www.lexpress.fr/actualite/societe/l-organisation-etat-islamique-et-ses-recrues-pour-l-apocalypse_1642623.html#RVeO4f96Zi0Zmkxs.99. Abu Osama al-Faranci“Enquête sur la vidéo appelant les musulmans français au jihad,”Libération (Paris), November 20, 2014, http://www.liberation.fr/monde/2014/11/20/des-francais-apparaissent-dans-une-nouvelle-video-de-propagande-de-l-etat-islamique_1146809. AbZeydAbZeyd, Twitter, accessed August 17, 2015, https://twitter.com/abouuOussama10. 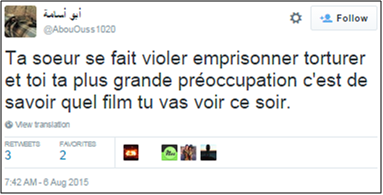 “Abu Osama” is a French-speaking propagandist and recruiter for ISIS. “You’re waiting for Dawla [the Islamic State, meaning ISIS] comes to you for you to finally take action? For more than a year it’s always the same guys on Facebook and Twitter…” (Tweet)AbZeyd, Twitter post, August 10, 2015, 3:17 p.m., https://twitter.com/abouuOussama10/status/630865556309155841. “Jihad is Fard ‘Ayn [a religious obligation] for ALL Muslims! You know this? And so?” (Tweet)AbZeyd, Twitter post, August 10, 2015, 3:04 p.m., https://twitter.com/abouuOussama10/status/630862257480728576. “Are they good your vacations in the sun? You had fun, huh? And your brothers who are being killed bc you stayed home, does that cross your mind occasionally?” (Tweet)Abu Osama, Twitter post, August 8, 2015, 8:09 a.m., https://twitter.com/AbouOuss1020/status/630033028392329216. 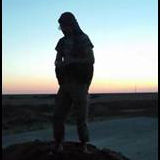 “Duas [prayers] for our brothers #IS[IS] who are facing the coalition in Alep[po] wilayat [province]. Oh Allah give victory to Your soldiers and humiliate Your enemies.” (Tweet)Abu Osama, Twitter post, August 8, 2015, 7:19 a.m., https://twitter.com/AbouOuss1020/status/630020401179987968. “For a year the routes were open wide, why did you not jump? [And] yet Allah has ordered you to do it!” (Tweet)AbZeyd, Twitter post, August 6, 11:21 a.m., https://twitter.com/abouuOussama10/status/629356598125809665. “One congratulates our brothers in Homs wilayat [province] for their new conquest, that Allah should give them even more victories #SoldiersoftheCaliphate” (Tweet)Abu Osama, Twitter post, August 6, 2015, 9:19 a.m., https://twitter.com/AbouOuss1020/status/629325858386395140. Abu Osama, Twitter post, August 6, 2015, 7:48 a.m., https://twitter.com/AbouOuss1020/status/629303028491886592. “Your sister has been raped[,] imprisoned[, and] tortured and you[,] your greatest concern is knowing what movie you’ll see tonight.” (Tweet)AbZeyd, Twitter post, August 6, 2015, 7:42 a.m., https://twitter.com/AbouOuss1020/status/629301494836281344. “WAllah [(I swear) by Allah] that the best sensation that I’ve had is when I took my first steps on the land of Islam [ISIS-held territory]…” (Tweet)AbZeyd, Twitter post, August 3, 2015, 12:28 p.m., https://twitter.com/abouuOussama10/status/628286274584117248. 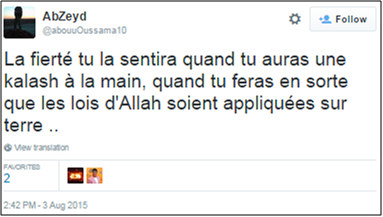 “You will feel alive when you enter the land of Islam WAllah [(I swear) by Allah] never will you feel better than in the land of Islam” (Tweet)AbZeyd, Twitter post, August 3, 2015, 12:11 p.m., https://twitter.com/abouuOussama10/status/628282065449058304. “The pride you will feel when you have a Kalash[nikov rifle] in hand, when you will ensure that Allah’s laws are enforced on Earth…” (Tweet)Abu Osama, Twitter post, August 3, 2015, 2:42 a.m., https://twitter.com/abouuOussama10/status/628320120306335744. “Prepare an answer to the question, ‘Why didn’t you fight My enemies like I commanded you’…” (Tweet)AbZeyd, Twitter post, August 2, 2015, 1:58 p.m., https://twitter.com/abouuOussama10/status/627946617354747904. “Jihad is an obligation for every Muslim who qualifies.” (Tweet)AbZeyd, Twitter post, August 2, 2015, 1:55 p.m., https://twitter.com/abouuOussama10/status/627945774291226624. AbZeyd, Twitter post, August 2, 2015, 5:57 a.m., https://twitter.com/abouuOussama10/status/627825539965972480. “The fight against disbelievers, emigration [hijrah] and jihad will remain until the end of time.” (Tweet)AbZeyd, Twitter post, August 1, 2015, 7:13 p.m., https://twitter.com/abouuOussama10/status/627663594595983360. “Oh you Muslims, Islam has never been a religion of peace, Islam is a religion of combat.” (Tweet)AbZeyd, Twitter post, August 1, 2015, 7:13 p.m., https://twitter.com/abouuOussama10/status/627663594595983360. “I would so like to be in that brother’s place…” (Tweet)AbZeyd, Twitter post, June 23, 2015, 5:39 a.m., https://twitter.com/abouuOussama10/status/613325454829817857. “Hurry, there are still routes open for the Hijra [migration]… #Tawakul [trust in Allah]” (Tweet)AbZeyd, Twitter post, June 17, 2015, 12:44 p.m., https://twitter.com/abouuOussama10/status/611258037047828481. “A small good pizza while on the job” (Tweet)AbZeyd, Twitter post, June 17, 2015, 12:40 p.m., https://twitter.com/abouuOussama10/status/611257133192056832. “We’re almost at the middle of the night, leave your tel[ephone] and your pc [computer] and pray to your lord for your brothers. Baraka Allah fik akhi [May Allah bless you, brother]” (Tweet)AbZeyd, Twitter post, June 14, 2015, 4:23 p.m., https://twitter.com/abouuOussama10/status/610225964975583233. Make du’a [supplication] for your success and stop wasting your time” (Tweet)AbZeyd, Twitter post, June 14, 2015, 4:19 p.m., https://twitter.com/abouuOussama10/status/609023874118918144. Allah Akbar [God is the greatest] Allah Akbar [God is the greatest]” (Tweet)AbZeyd, Twitter post, June 11, 2015, 8:46 a.m., https://twitter.com/abouuOussama10/status/609023874118918144. “The Muslim population is watching Islamic State [ISIS] videos .. It’s not in France that you will see this” (Tweet)AbZeyd, Twitter post, June 10, 2015, 9:22 a.m., https://twitter.com/abouuOussama10/status/608670568506880000. “It’s not in France that you will see this… ma sha Allah [whatever Allah wills]” (Tweet)AbZeyd, Twitter post, June 6, 2015, 3:51 a.m., https://twitter.com/abouuOussama10/status/607137658612121600. “This is a message from your French brothers who have made Hijra [migration], to the Muslims who are still living in the land of Kufr [disbelief]. What are you waiting for? Why do you not perform Hijra? How do you accept to walk in the land of Kufr when Allah has opened a door for you to perform the best of deeds, Jihad in the path of Allah. You strengthen their economy and pay taxes which they use to fight us, and kill our sisters, our women and our children. Are you not embarrassed? Repent to your Lord and come and join us. Because a day may come when the borders will be closed and you will be left only with tears and regret. Do you fear? Many of our women made Hijra whilst still in their pregnancy, and then gave birth here. Are you not embarrassed? The road is easy so there are no excuses for you.” (ISIS Video) “Des combattants français de l’Etat islamique appellent les musulmans à commettre des attentats en France,” MEMRI FR, November 20, 2014, http://www.memri.fr/2014/11/20/des-combattants-francais-de-letat-islamique-appellent-les-musulmans-a-commettre-des-attentats-en-france/.